Squeezils (Hold Onto Your Nuts!) 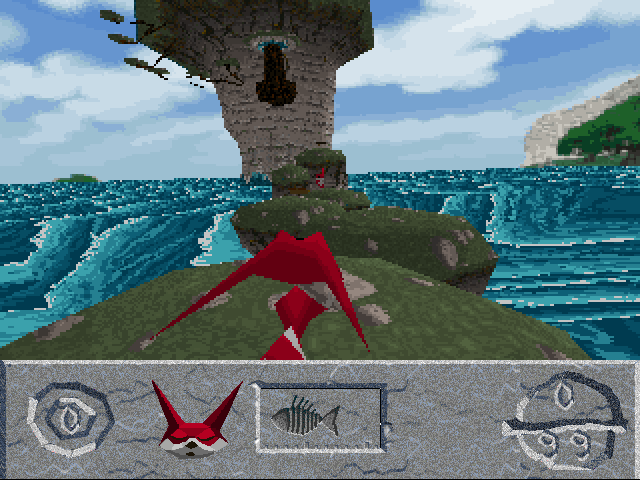 is a 3D action-adventure game that I first got my hands on via the Games Sampler 2 for Windows 95 CD. That same CD also had playable demos of other games which included: Decathlon, Captain Quazar, You Don’t Know Jack, Diablo, The Neverhood, Road Rash, Fire Fight, Drowned God, Ravage D.C.X., Flight Unlimited, Hellbender, Monster Truck Madness, War Wind, Free Enterprise, and Deathdrome. Squeezils was developed by Protozoa and published by Inscape in 1997, a time when 3D graphics were the the best thing since sliced bread. As a child, I remember how fascinated I was with this game, and it may have been one of the first 3D games I had ever played. Squeezils tells the story of a bunch of squirrel-weasel hybrids who reside in a peaceful woodland valley until one day, the Great Flaming Nut comes and unleashes his wrath. You control the squeezils, constantly hungry little critters who must set out in search for shiny golden rocks to feed the nutty demi-god. Whether they ultimately prevail is up to you, as you guide them over rocks, make them jump onto special transport vehicles, and watch them explore the wonders of nature. Beginning on a stone pillar in the middle of the ocean, you are put in charge of a single squeezil and tasked with finding the coveted shiny golden rocks whilst also managing to survive. The controls in Squeezils are very simple. You move around using the arrow keys on the keyboard and use the spacebar to jump. You can also spit out nuts that you collect by pressing ‘A’, in order to defend yourself from other squeezils who might be blocking your path, but it’s fairly easy to get past them without too much trouble. Despite their simplicity, the controls do feel rather jerky, and the camera angle can be disorienting if you move too quickly, so I feel this game would have played much more smoothly if the control speed had been slower. On the up-side, the jumping movement works well, and is accompanied with cool sound effects-a cartoon style boing combined with the noise of a car screeching-absolutely fabulous. The jump key can become unresponsive if you leave the controls idle for too long, which causes your squeezil to fall asleep. This will consequently affect your timing when you are trying to make important, nay, life-saving jumps, like when you need to board the bumblebee helicopter in order to navigate the area. And timing is everything, since if you jump too early or too late, you are swallowed up by the water below and must restart from the beginning (R). Squeezils often feels frustrating for this reason, as it’s easy to make a mistake and die, so I think the game could make do with either a save or checkpoint feature. 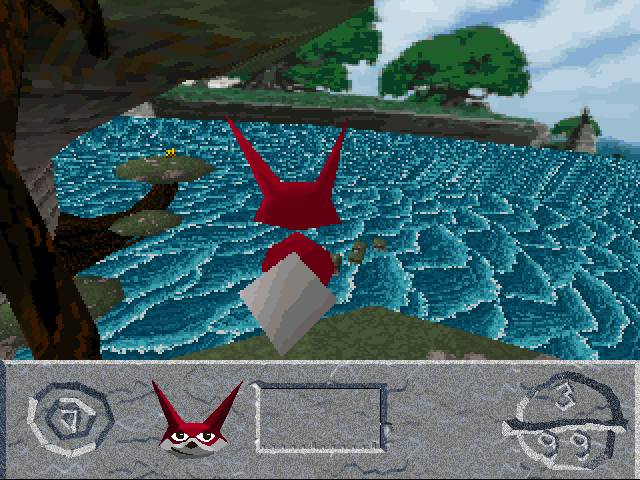 But considering this is only a demo version, many of the final game features weren’t yet accessible, including the ability to fly as far as I can tell. As for whether Squeezils did eventually get developed into a full game, I’m not sure, but all I can say is that it still has a lot of promise. 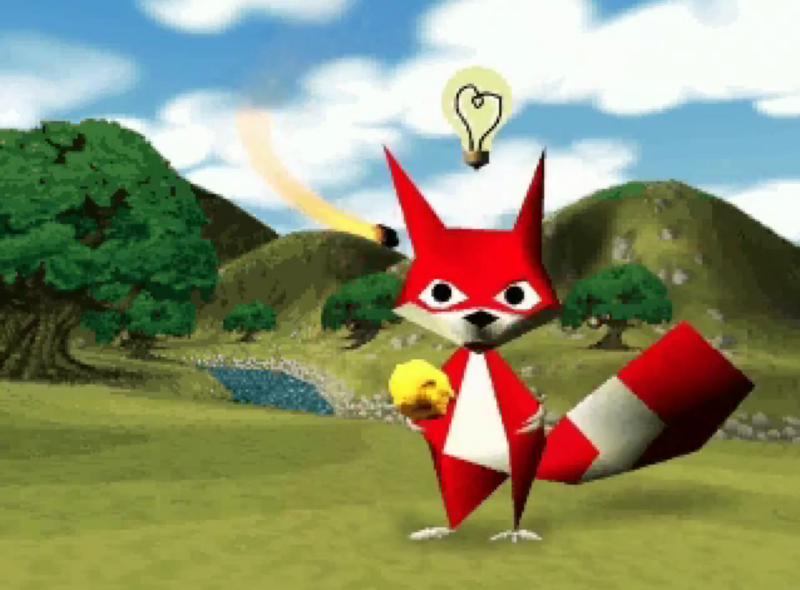 For something made in the nineties, Squeezils has visuals that are pretty good for a 3D adventure style game. 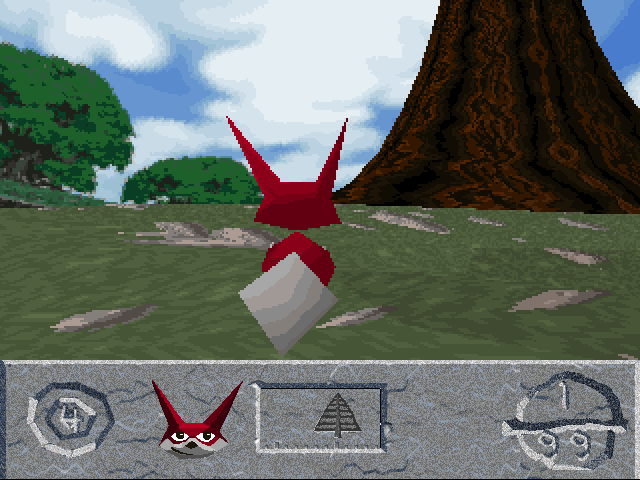 Many of the shapes-take the squeezil himself for example-are sharp, quite angular, and are not what you’d find in a more modern 3D platforming game-and that’s precisely what I love about these older titles. It’s as if somehow by refining the game environments, characters, collectibles and so on, you lose some of the game’s original magic (I felt the same way when I saw how different Banjo and Kazooie both looked in Nuts & Bolts). I also like the way the stone slab at the bottom of the screen feeds into gameplay; it has a very stone age, prehistoric kind of vibe, and it makes me curious when the image in the centre shifts to match what is nearby in the environment. Squeezils is blessed with a really fantastic animated introduction sequence, and the effort that went into including such a hilarious voiceover can simply not go unnoticed. As I discussed earlier, gameplay is peppered with great cartoon-like sound effects, and I feel that the voiceover could have been manipulated in the same way-for example, by gradually revealing new pieces of the story to players. Apart from the great sound effects, there isn’t much of a backing track to the demo version of Squeezils, and there is a monotonous fizz sound in the background which can be slightly jarring. What I did like, however, was the sound of the ocean coupled with the occasional cries of seagulls. Those two things added authenticity to the game and I think it would have been even more wonderful if the ocean was animated. On the surface, Squeezils seems like a simple enough game to play. Even the controls would suggest that is the case. However, what makes this game challenging is how easy it is to mistime a jump, or move too quickly and end up as shark bait. I had a lot of fun exploring the stone pillars, and eventually succeeded with my attempts to reach the tree at the very top of the tower. There were some other squeezils there who knocked into me a few times, which act as the only ‘enemies’ of sorts aside from the standard water death, but they don’t actively seek you out and damage your health. In the game’s download files, there is a readme that says the trickiest part of this whole stage is reaching the golden rock-and that is absolutely true. There are several mushroom-like ledges that are attached to the tower which you need to hop over in order to reach the rock. And as you can see below, I saw it. I tasted its glory. But alas, I did not reach its splendour. Finding and being able to play Squeezils after not having played it since primary school felt amazing. Not only was it a great experience getting to relive some wonderful memories, but it’s always nice to see the evolution of one of my favourite gaming genres. You’re nuts about squirrels. Or Weasels. I believe the complete version can be downloaded here, but I haven’t been able to run it successfully on Windows 8 yet without getting a message that says SetEntries failed (front) Generic failure. If anyone figures out how to fix this problem, please let me know! Update (Jan 2016): The complete version above runs fine on Windows 7. Below is some gameplay footage that seems to extend beyond the demo version, and YouTube user barbarian bros has kindly uploaded the opening trailer for Squeezils should anyone want to see it. (i.) In order to make the demo run on newer systems like Windows 7, and Windows 8, you’ll also need to download a file called d3drm.dll, which is a (DLL) file that used to work in Direct3D for older Windows systems. Some websites say you should not download the d3drm.dll file, as it is not safe (viruses, comprimising your computer’s security etc.) and say that you should instead try to download the latest version of Microsoft DirectX. The latter didn’t work for me, and so far I haven’t had any problems with the d3drm.dll file I downloaded, which was from www.microflight.com. (ii.) One problem I noticed after pressing a few buttons in the game, was that it exited and a pop up box saying: “The pixel format was invalid as specified” came up. To solve that problem, right click the Squeezils application icon, and click Properties. Then, under the Compatability tab, change the Compatability mode so it runs for Windows 7, 8, or whichever system is suitable in your case. I also chose to run the program as an administrator just in case. So after a bit of tweaking around the game will definitely run. (iii.) If you try to take a screenshot using the Print Screen button and then get back into the game, it will freeze and a Display Error (Bit failed. Action not supported.) will come up. When you try to click on the cross, it won’t close unless you open the Task Manager (Ctrl+Alt+Delete) and end the program like that. For this reason, I recommend giving the game a good playthrough before taking any screenshots, or just using a smartphone to take pictures as you play. 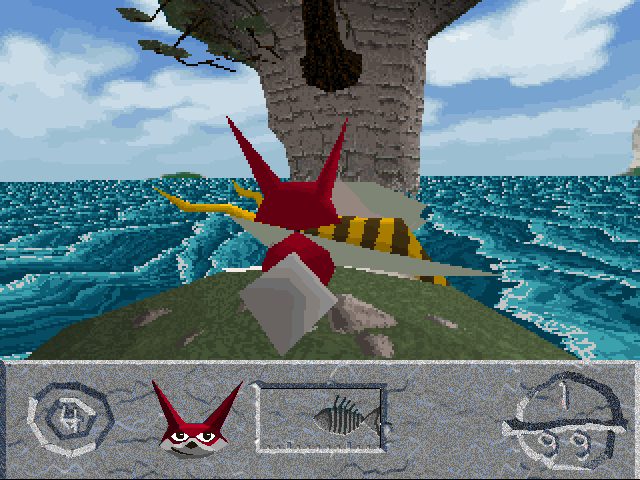 Posted in ReviewTagged 1997, 3D, action, adventure, first person, flying squirrel simulator, game review, Games Sampler 2 for Windows 95, hold onto your nuts!, inscape, ms-dos, PC game, platformer, protozoa, retro game, squeezils, windowsBookmark the permalink. That Games Sampler 2 for Windows 95 was the first demo disc I got with my Pentium 1 PC back in 1997. I later procured the Games Sampler 1 disc as well. Those were undoubtedly the best demo discs ever compiled. As for Squeezils (AKA “Hold onto your Nutz!”), I enjoyed the demo, the controls really aren’t bad at all when playing on a slower machine, like a 133MHz Pentium. The full game is widely available for download, and I’ve been able to play it on my Windows 98SE P2 build, but it’s missing cinematics and some sounds later in the game. I don’t think the game was ever released on the retail market unfortunately. Quite sad actually. Hi NvidiaTI, thanks for your comment! :) I completely agree with that. I never got a chance to play Games Sampler 1, but all the games I played on Sampler 2 were some of the best (and weirdest) games ever. That must be it, if I played Squeezils on an older computer it probably would have made the experience much smoother in terms of controls. I think I found the full game but couldn’t get it to work, and the fact that I’m running Windows 8 probably has a lot to do with that-sigh. Great, great demo though, and I’m glad you like it too:) Indeed, it’s a shame the full version of Squeezils (to the best of my knowledge) didn’t hit the retail market. But who knows, maybe the developers will revisit Squeezils again sometime. I sure hope so! Where I can buy original version of this game. That was Big Box or CD? Hi Max! To be honest, I don’t know if they still sell it anywhere-there were a couple of listings on ebay but they sold. It was on CD with a bunch of other games, and the CD originally came as part of Windows 95. In the mean time, for just the Squeezils demo you can try: https://archive.org/details/swizzle_demu_NUTS, and for the full game try here: http://www.hotud.org/component/content/article?id=23434.